Does anyone know why Sweet Caroline by Neil Diamond is a tradition at Red Sox games? Anyone? Red Sox Nation? Don’t get me wrong– I’m not trashing the song or anything. It’s just funny that this of all songs became such a popular singalong at Fenway Park. For those who don’t know– If you are a Masshole, you are basically required to sing this when you attend baseball games in Massachusetts. Especially the call and answer that’s not even part of the original song: Good times never seemed so good… So good! So good! So good! 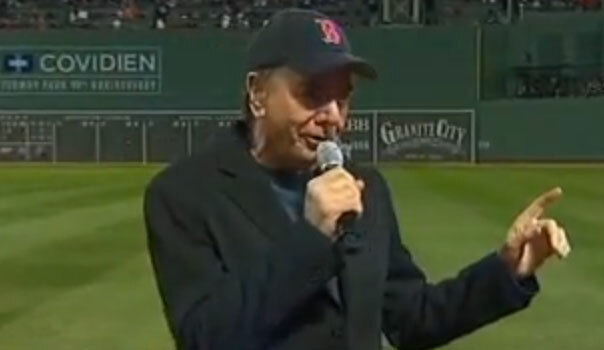 Here, Neil Diamond performs his crowdpleaser, Sweet Caroline, at Fenway Park for the Red Sox season opener on Easter Sunday, April 4th, 2010. You better wear sunglasses or the Diamond might shine in your eyes, son! It’s pretty awesome to have an entire stadium singing your song, ain’t it Neil? BTW, loved the back of your jacket that said ‘KEEP THE DODGERS IN BROOKLYN’.